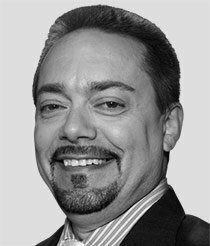 Trade Alert: Tom Gentile recommended closing out his latest winning trade in just 22 days for an astounding 384.91%. Learn more about the details behind this fast-cash strategy right here. And with fall earnings approaching, history is all you need to grab the cash you've been looking for. A big part of trading is predicting the future – and the best (and only) way to do this is by turning to the past. For example, moving averages are produced by calculating historical prices and are illustrated as a line on a chart. These moving averages can be used in several different ways. For instance, two moving averages are used in the "10/30 crossover" that we talked about a few weeks ago. Regardless of the strategy, though, it really all boils down to one thing: taking the historic results and data and applying them to the live market. Now, there are thousands of strategies out there, but today, I want to talk about one of my favorites: stocks that gap on earnings announcements. This pattern is reliable, consistent, and it tends to repeat more than not. 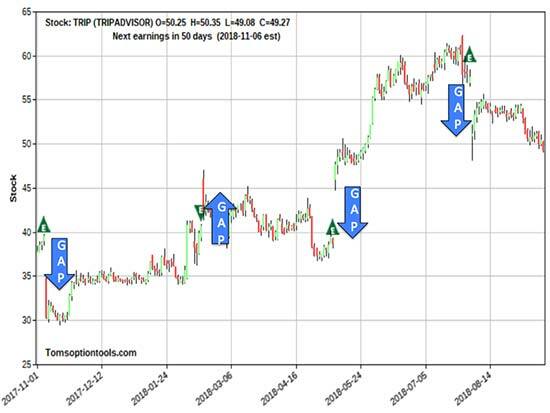 Take a look at the chart below on TripAdvisor Inc. (Nasdaq: TRIP). As you can see, over the last four earnings periods, TRIP has gapped down two times and gapped up two times. And here's the thing: Stocks that gap will rarely gap in one direction only. Now, one of the great things about stocks that gap at earnings is that they attract a lot of attention from traders that want to profit from these consistent movers. Many will pick a direction and count on the stock moving that way. And this attention comes with side effects. You see, there are several stocks that consistently move in one particular direction before the announcement. Some stocks will move consistently up into the earnings announcement – and others move consistently down. One of the major benefits of this pattern is that we can either buy or short shares based on the direction that the stock takes into earnings without dealing with any potential gap in the wrong direction by holding over the announcement. 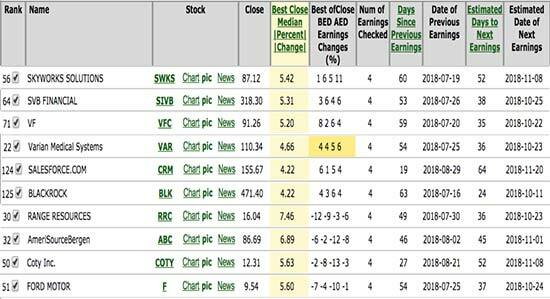 The first stock in the list, Skyworks Solutions Inc. (Nasdaq: SWKS) has moved up an average of 5.42% over seven trading days before the earnings announcement for four earnings periods in a row. Each positive move for the past four earnings periods is shown to the right of the average. The seventh stock in the list, Range Resources (NYSE: RRC), has moved down an average of 7.46% over the past four earnings periods. You'll notice the four negative moves shown next to the average. Also shown are the next estimated earnings dates on the horizon, which will be used as our exit. So here we have historical data that shows us stocks that consistently move in a particular direction seven trading days before their earnings announcements, along with their historical average moves. If history repeats (which, as we know, it normally does) we can anticipate the seven-day returns shown in the chart.